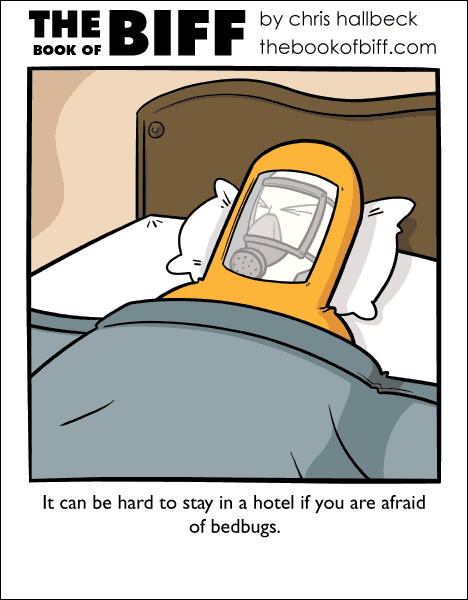 The bedbugs will get so out of hand in the future that hotel rooms will be disposable. After each occupant leaves the entire room will be jettisoned from the hotel, dissolved and recycled. A new room will be printed and installed in just a few hours. Oops, I left my laptop in the hotel room. Do you think they’ve dissolved it yet? They’d probably do a sweep before. And then keep what they find. But will people still have to wear one of these hazmat suits even if the hotel rooms are disposable? I don’t think it would be that very comfortable to sleep while wearing one! No, those would just be fashionable at that point. But it will be shiny silver because… FUTURE. But then what will happen to all of the housekeeping staff? They are now the room installation staff. And the awesome thing is, the sidebar add is for Bed Bug prevention supplies. That’s not awesome. That’s horrendous. I had bed bugs once. It was horrible. There are things on the internet that I would sooner remember over those things. this one kinda hits home for me. my bedframe was completely infested with the little demons. my mother in a nutshell. This is a completely reasonable reaction to finding a bedbug. No sarcasm at all, this is genius.